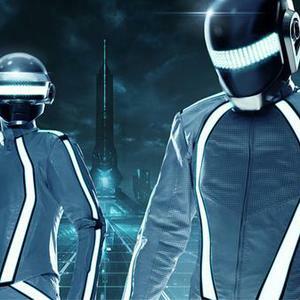 Daft Punk is a multi Grammy Award-winning electronic music duo formed in 1994 in Paris, France, and consisting of French musicians Guy-Manuel de Homem-Christo (born 8 February 1974) and Thomas Bangalter (born 3 January 1975). The band is considered one of the most successful electronic music collaborations of all time, both in album sales and in critical acclaim. Daft Punk reached significant popularity in the late 90s house movement in France, along with other artists such as Air, Cassius, and Dimitri from Paris. Thomas Bangalter and Guy-Manuel de Homem-Christo met in 1987 on the grounds of the Lyc?e Carnot, a secondary school in Paris. The two became good friends and later recorded demo tracks with others from the school. This eventually led to the formation of the guitar-based group Darlin' with Laurent Brancowitz in 1992. Bangalter and de Homem-Christo played bass and guitar, respectively, while Brancowitz performed on drums. The trio had branded themselves after The Beach Boys song of the same name, which they covered along with an original composition. Stereolab released both tracks on a multi-artist Duophonic Records EP and invited the band to open for stage shows in the United Kingdom. Bangalter felt that "The rock n' roll thing we did was pretty average, I think. It was so brief, maybe six months, four songs and two gigs and that was it." A negative review in Melody Maker subsequently dubbed the music "a bunch of daft punk." Instead of dismissing the review, Bangalter and de Homem-Christo found it to be amusing. As the latter stated, "We struggled so long to find [the name] Darlin', and this happened so quickly." Darlin' soon disbanded, leaving Brancowitz to pursue other efforts with Phoenix. Bangalter and de Homem-Christo formed Daft Punk and experimented with drum machines and synthesizers. The liner notes of Homework pay tribute to a large number of musical artists and contains a quote from Brian Wilson. Bangalter expressed that "In Brian Wilson's music you could really feel the beauty - it was very spiritual. Like Bob Marley, too." When questioned on the success of Daft Punk's debut album and rising popularity of their associated musical genre, Bangalter responded, "before us you had Frankie Knuckles or Juan Atkins and so on. The least you can do is pay respect to those who are not known and who have influenced people." The Daft Punk track "Teachers" on Homework refers to several influences including Romanthony and Todd Edwards. De Homem-Christo stated that "Their music had a big effect on us. The sound of their productions ? the compression, the sound of the kick drum and Romanthony's voice, the emotion and soul ? is part of how we sound today." In the fall of 1997 they did their Daftendirektour to promote Homework in several cities throughout the world. For this tour Daft Punk opted to utilize their home studio equipment for the live stage instead of creating a more conventional DJ set. As Bangalter stated, "Everything was synched up ? the drum machines, the bass lines. The sequencer was just sending out the tempos and controlling the beats and bars. On top of this structure we built all these layers of samples and various parts that we could bring in whenever we wanted to." 25 May 1997 saw them perform at the Tribal Gathering festival at Luton Hoo, England, headlining with Orbital and Kraftwerk. Also of note is the November 8 performance in Birmingham, UK, from which came the recording of Alive 1997. Daft Punk made a surprise appearance at the 50th Grammy Awards on February 10, 2008. The duo appeared with Kanye West to perform a reworked version of "Stronger" on stage at the Staples Center in Los Angeles. For the appearance, Daft Punk utilized four JazzMutant Lemur controllers. A press release specified that this was the first televised live performance by the duo in their career. Bangalter's wife, ?lodie Bouchez, also attended the event.